Mao in Wuhan in 1927 Mao Zedong (1893-1976) was one of the major figures of the 20th century. "If power is measured by impact on people's lives," Emily MacFarquhar wrote in U.S. News and World Report, "Mao Zedong was the most powerful man in history. The wars and revolution and political campaigns he led left no one untouched in a country of hundreds of millions. His quixotic crusades may have killed more people than the mass exterminations of Hitler and Stalin combined. In his lifetime, he was worshiped as a god and his books sold better than the Bible. After his death, he was demystified and dethroned. Today, he is the object of a pop culture cult." Mao's biography, Mao: the Unknown Story , by Jung Chang and John Halliday begins in a similar vein: “Mao...who for decades held absolute power over the lives of one quarter of the world’s population, was responsible for well over 70 million deaths in peacetime, more than any other 20th century leader.” Henry Kissinger wrote that a "recent biography" of Mao (presumably Mao: The Unknown Story ) was interesting but "one-sided." On the positive side, Mao was a brilliant political tactician, a clever, charismatic and persuasive leader, a survivor who time and again outmaneuvered his rivals, and a prolific writer who described himself as an “indefatigable teacher.” He showed his toughness and patience during the Long March and again in his resistance against the Japanese. 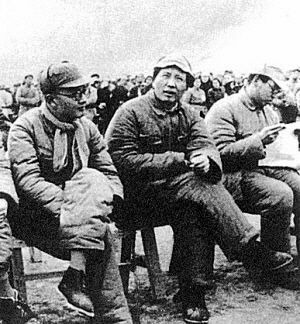 On the negative side he was obsessed with power and eliminating his enemies and many of his ideas such as the Great Leap Forward were half baked. Mao Zedong was born in December, 1893 on a canopy bed in his family’s tidy, 13-room farm house, set in a beautiful location outside Shaoshan, Hunan Province. During the Cultural Revolution, the Red Guard chanted "The sun rises in Shaoshan" and some Chinese changed their name to Shaoshan in Mao's honor. In the 1960s, three million people a year visited Mao's house, with as many as 120,000 showing up on a single day. Some treated it as a of pilgrimage site, trekking their on foot from some far off place. Today only a handful of people visit Mao's house each day and the train to Shaoshan is often half empty. Mao's family houseMao was the oldest surviving child in his family. He had two younger brothers. Mao was large for his age. He liked to eat fermented tofu and compose poetry, According to one story he read history books while he swam in the Xiang River. He reportedly developed his love for swimming in the fish pond in front of his childhood home. Mao attended primary school in Shaoshan from ages 8 to 13. Shaoshan was a typical farming village where many people struggled with poverty and hunger. Mao left his hometown as a teenager and as far as anyone knows only returned twice. At the age of 16, he went to Changsa, near Shaoshan, to attend secondary school. He was trained in Confucian classics and worked as an accountant in his father's business while in school. One of Mao's greatest heros when he was young was Qin Shi Huangdi, the first emperor of China. Not yet a radical he wrote that: "I considered the emperor as well as most officials to be honest, good and clever men." As he got older Mao became more radical. His favorite novel reportedly was The Water Margin, an epic story about a group of insurgents who lived during the Song dynasty. 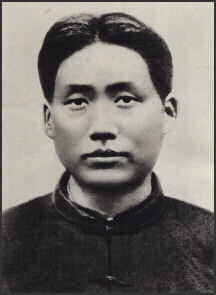 Mao's father was a "relatively rich peasant" who as a young man had his land taken away and was forced to serve in the army to pay off some large debts. After being released from the army he worked and saved enough money to buy back his land. He became a "rich peasant" by selling surplus rice and buying up rice from poor farmers and selling it a higher price to rice merchants. When Mao was a teenager, his father made a killing by village standards by buying up mortgages from poor peasants and making a profit on the interest the peasants paid him. 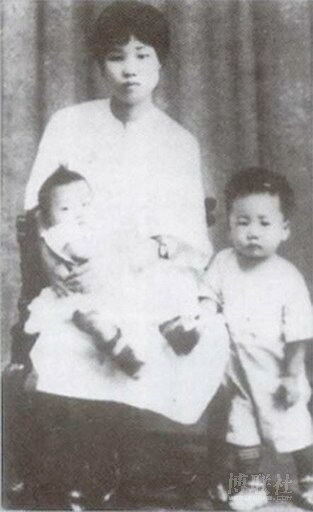 Mao was close to his mother. She studied Buddhism and had bound feet. He regarded his father as a disciplinarian whom he once said, "I learned to hate.” According to one fable, Mao was accused of being lazy and fat and slugged by his father in front of guests at a house party. Mao reportedly told his father to go to hell but then allowed him to save face by saying, "Confucius says elders must be kind and affectionate to the young. However I will kowtow on one knee if you promise not beat me." Mao's 1st wife Yao Ka in 1924 When Mao was a young boy a severe famine hit the Hunan province and the Manchu governor was killed in a food riot. Mao wrote he "felt that there with the rebels were ordinary people like my own family and I deeply resented the injustice in the treatment given to them." Around the same time Mao wrote he was impressed by the tactics used by some rebels in the hills around Shaoshan to fight rich landowners and was also taken with a radical school teacher who argued that Buddhist temples should be converted into schools. After the collapse of the Qing dynasty in 1911, Mao joined the Chinese army but quit six months later. 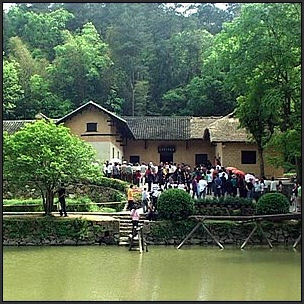 Between 1913 and 1918, Mao attended the Hunan No. 1 Teacher's Training School in Changsa and returned there in 1920 to work for a year as a teacher. In Changsa, Mao was exposed to the revolutionary ideas preached by Sun Yat-sen, heard about the Canton and Wuhan uprisings and read about socialism in Russia in the newspapers. Mao started a night school for farmers in 1917. Describing his early years in Changsa, Mao wrote, "At this time my mind was a curious mixture of ideas of liberalism, democratic reformism and utopia socialism...and I was definitely antimilitarist and anti-imperialist." In 1918 Mao worked as an assistant to the chief librarian of the University of Beijing, where he first began to study Marxism seriously and where he met with many of the founders of the Communist Party. When Mao returned to Changsa, he wrote, "I became more and more convinced that only mass political power, secured through mass action, could guarantee the realization of dynamic reforms." In Changsa, Mao became editor of a radical student newspaper called the Xiang River Review. In 1920 he began organizing workers and calling himself a Marxist. He recruited new members for the Communist Party with an ad in the local Changsa newspaper "inviting young men interested in patriotic work to make contact with me." This is how Mao met Liu Shaoqi, later an important general in the Long March and a president of China, and Xiao Chen, a founding member of the Communist Party. In 1921, Mao attended the founding meeting of the Chinese Communist Party in Shanghai. In 1922 he organized the Hunan provincial branch of the Communist Party and set up labor and student unions. His revolutionary activities among peasant angered landlords in Hunan and Mao was forced to flee to Canton, where the Kuomintang and Communists held power as allies. With the 1927 split between the Kuomintang and the Chinese Communist Party (CCP), the CCP began to engage in armed struggle against the Chiang regime. The Red Army was established in 1927, and after a series of uprisings and internal political struggles, the CCP announced the establishment in 1931 of the Chinese Soviet Republic under the chairmanship of Mao in Jiangxi Province in south-central China. Mao in the 1930s In 1927, Mao led a group of Hunan peasants in the mountains of Jiangxi Province, where they created a Soviet-style government and started building a guerilla force. By 1930 the Jiangxi Soviet controlled several million people and the Red Army numbered 200,000. In the meantime the Kuomintang began a campaign to exterminate the Communists. In the 1930s Mao traveled to villages, where peasants grew rice for wealthy landlords and ate nothing but potatoes themselves, and called on them to take up arms and take the land for themselves. At that time Mao was described as tall, rangy and good looking. He chain smoked and looked people directly in the eye, exuded coincidence and persuaded peasants with his logic and charisma. Mao received trunks full of Mexican silver dollars and instructions from Soviet leader Joseph Stalin, without which many historians have argued the Long March would not have been possible. Stalin is said to have played a major role in Mao’s rise. Betrayal and intra party rivalry led to frequent purges. Blunders by Mao led to the unnecessary loss of thousands in hopeless battles. 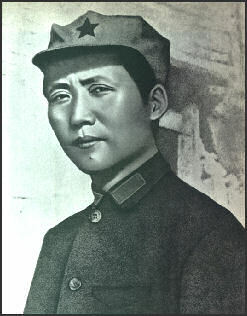 Against the advise of Mao and his followers, Li Lisan, leader of the Communist Party at that time, committed 180,000 men to a series of great battles in the early 1930s against the Kuomintang, who was being advised by Prussian officers who taught the Kuomintang how to build forts and fortify supply lines to entrap their enemy. The Communists lost the battles and their movement almost collapsed. Mao took control of the Communist Party after he refused Li's orders to lead a major offensive against Changsa. During the Long March Mao consolidated his hold over the CCP. Shortly after the march began, Mao was elected chairman of the Communist Party at a politburo conference in Kweichow in 1935. With Mao at the helm, the Communists stuck to guerilla warfare and avoided large battles. Text Sources: Asia for Educators, Columbia University afe.easia.columbia.edu <|>; Robert Eno, Indiana University indiana.edu /+/ ; Library of Congress; New York Times; Washington Post; Los Angeles Times; China National Tourist Office (CNTO); Xinhua; China.org; China Daily; Japan News; Times of London; National Geographic; The New Yorker; Time; Newsweek; Reuters; Associated Press; Lonely Planet Guides; Compton’s Encyclopedia; Smithsonian magazine; The Guardian; Yomiuri Shimbun; AFP; Wikipedia; BBC. Many sources are cited at the end of the facts for which they are used.